Again on the topic of start up companies in India, lately I’ve been really impressed by the many innovative new travel companies offering India experiences that are “off beat” and “out of the box”. These experiences are very different to those of package tours, and they enable travelers to really connect with the heart and soul of India. 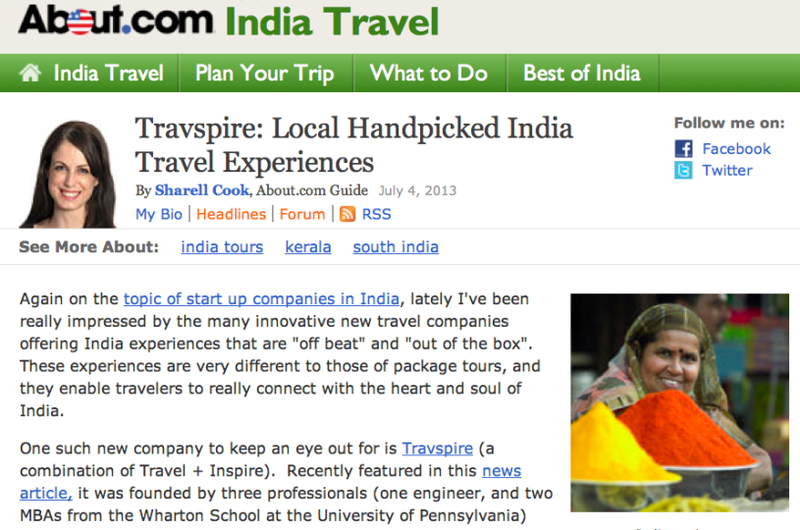 One such new company to keep an eye out for is Travspire (a combination of Travel + Inspire). Recently featured in this news article, it was founded by three professionals (one engineer, and two MBAs from the Wharton School at the University of Pennsylvania) with a passion for travel. Together, they enrolled in the Wharton Venture Initiation Program, which is the Wharton School’s incubator program for start ups, and gained support from the Wharton Innovation Fund.